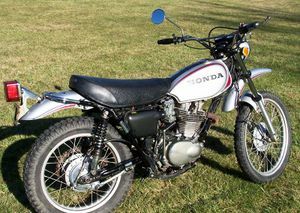 Honda XL250 is a four stroke 250cc motorcycle from Honda introduced in 1972 and manufactured through most of the 1980's. 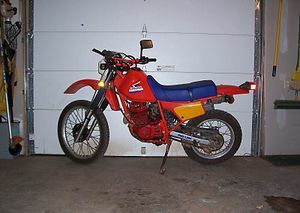 It is an "enduro" or "dual purpose" bike meaning it physically looks like a dirt bike, and shares many characterstics with a dirt bike, but it is street legal. 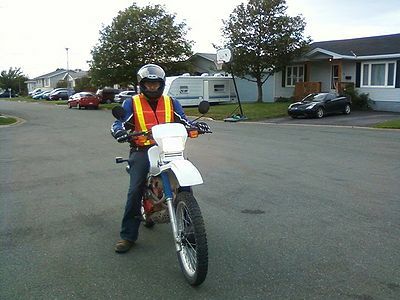 The bike is completely mechanically operated as there are no hydraulics on the bike. 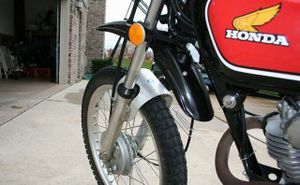 The 250cc motor produces 24 horsepower and the bike weighs 288lbs with oil, grease, and gasoline. Fuel capacity is 2.388 gallons. 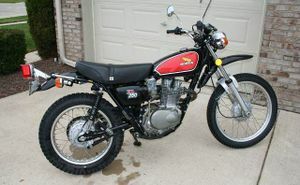 Demand for this model has remained high among collectors and enthusiasts. 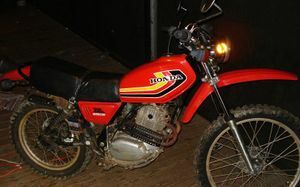 The Honda Motosport 250 XL250 was sold in 1972-73. One color was available: Custom Silver Metallic. 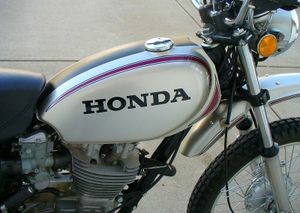 The fuel tank, fenders, and headlight shell were silver while the fuel tank stripes and fender stripes were red. 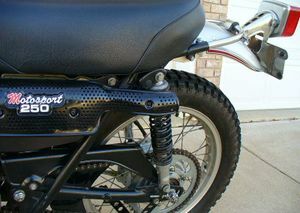 The "MOTOSPORT 250" muffler emblem was red and white. The side cover was black without emblems. 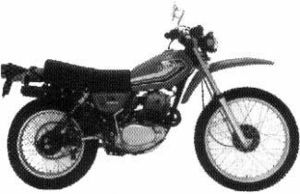 The engine was a 248cc 4-stroke OHC 4-valve single cylinder with a 5-speed transmission. The frame serial number began XL250-1000049 while it is significant that the engine serial number began SL250E-1000001 rather than XL -- which shows its relation to the Motosport series. 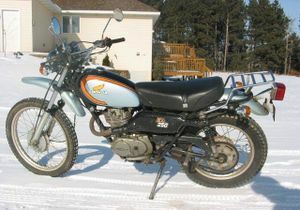 The XL250K1 was sold in 1974 in tornado Blue Metallic. The gas tank stripes were orange and black. 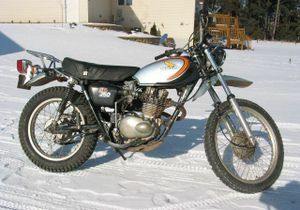 The "XL250" muffler and side cover emblems were orange and white. 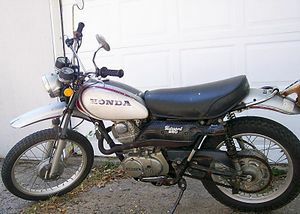 The side cover and headlight shell were black. The instrumentation was tilted toward the rider. 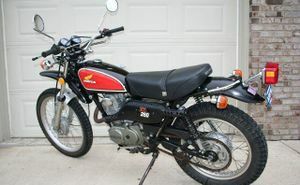 The engine was a 248cc 4-stroke OHC 4-valve single cylinder with a 5-speed transmission. 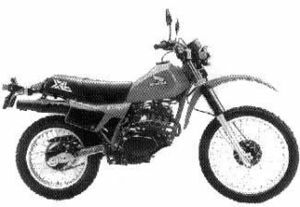 The serial number began XL250-2000001. 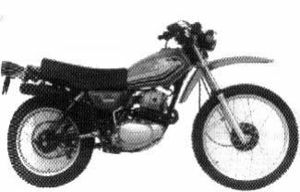 The engine serial number began XL250E not SL250E. 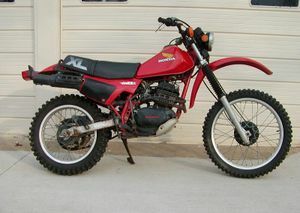 The XL250K2 was sold in 1975 in Excel Black with Red. 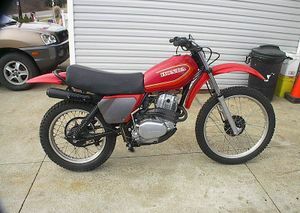 The gas tank was a 2-tone red and black. The fenders and side covers were black. 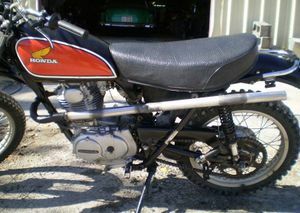 The "XL250" muffler and side cover emblems were red and white. The headlight shell was silver. 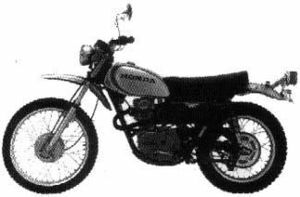 The engine was a 248cc 4-stroke OHC 4-valve single cylinder with a 5-speed transmission. The serial number began XL250-3000001. 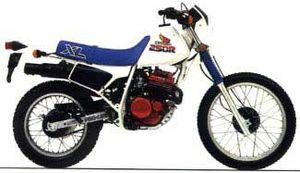 The XL250'76 was sold in 1976 in one color: Candy Sapphire Blue with white. The gas tank and side covers were blue. The fenders were white, color impregnated plastic. 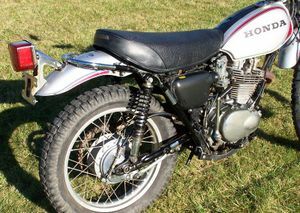 The frame was new and the chassis design featured an upswept exhaust. The intake manifold was center mounted. 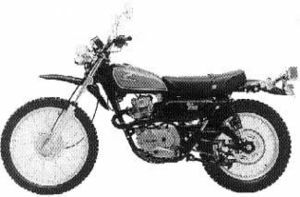 The engine was a 248cc 4-stroke OHC 4-valve single cylinder with a 5-speed transmission. 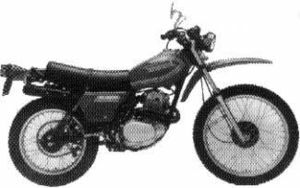 The serial number began XL250-4000001. 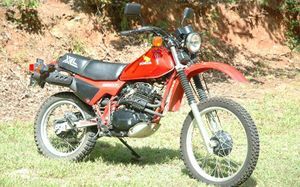 The XL250S'78 was sold in 1978 in one color: Tahitian Red. 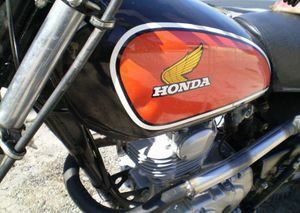 The gas tank stripes were black, red, and light orange. 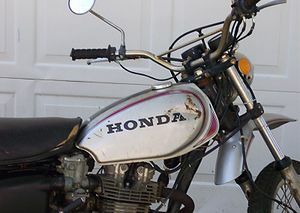 The "HONDA" tank decal was white. 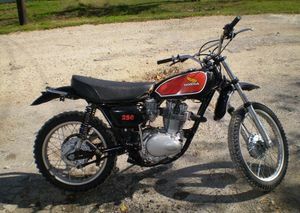 The "XL250S" side cover decal was black and white. The front wheel was 23" while the back was 18". The instrumentation featured only a speedometer. The engine was a 249cc OHC 4-valve single cylinder with 2 head pipes. The transmission was a 5-speed. 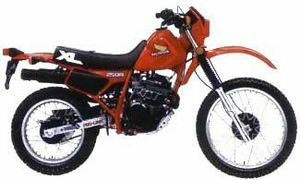 The serial number began XL250S-5000041. 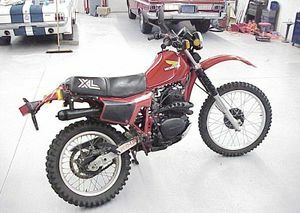 The XL250S'79 was sold in 1979 in Tahitian Red. 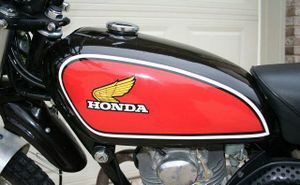 The gas tank stripes were black, red, and yellow. 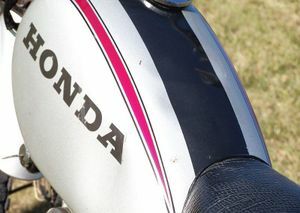 The "HONDA" tank logo was black. The front wheel was 23" while the back was 18". 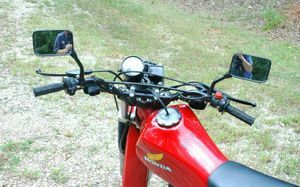 The instrumentation featured only a speedometer. 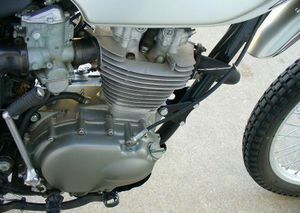 The engine was a 249cc OHC 4-valve single cylinder with 2 head pipes. The transmission was a 5-speed. The serial number began XL250S-5100007. 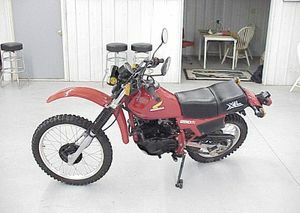 The XL250S'80 was sold in 1980 in Helios Red. 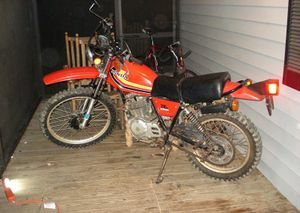 The gas tank and side cover stripes were red, orange, and white. 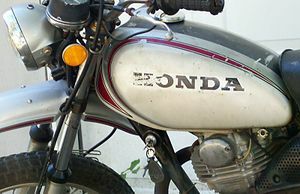 The "HONDA" tank logo was red outlined in white. 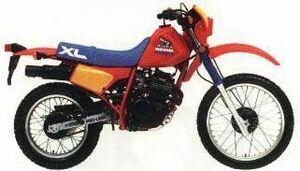 The "XL250S" side cover logo was white. The control levers and kickstarter arm were black. The speedometer had an 85 mph (135 km) limit. The front wheel was 23" while the back was 18". The instrumentation featured only a speedometer. 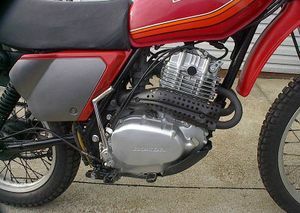 The engine was a 249cc OHC 4-valve single cylinder with 2 head pipes. The transmission was a 5-speed. 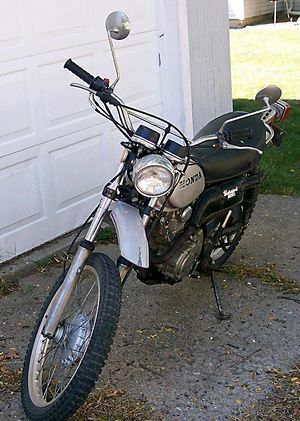 The serial number began XL250-2000001. 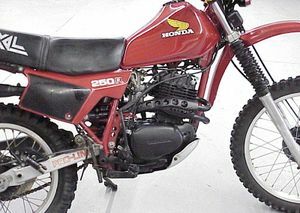 The XL250S'81 was sold in 1981 in Monza Red and Black. 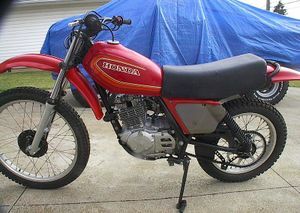 The gas tank and side covers were 2-tone red and black. 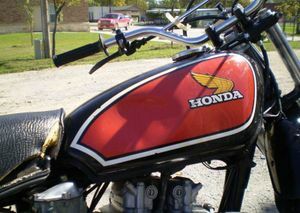 The "HONDA" tank logo was black. 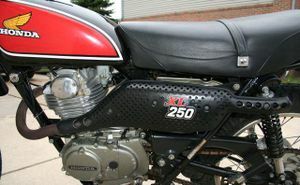 The "XL250S" side cover logo was red and white. The swingarm was painted silver. The front wheel was 23" while the back was 18". The control levers and kickstarter arm were black. 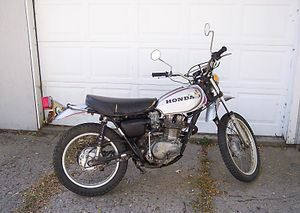 There was a 2-piece instrumentation: speedometer and indicator light pod. The speedometer had an 85 mph (135 km) limit. 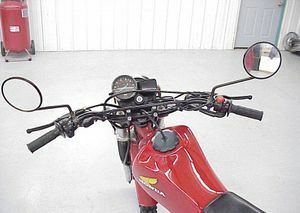 The instrumentation featured only a speedometer. 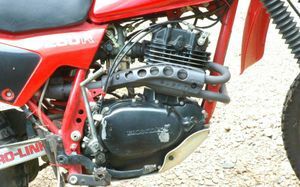 The engine was a 249cc OHC 4- valve single cylinder with 2 head pipes. The transmission was a 5-speed. The serial number began JH2MD010*BM300001. The XL250R'82 was built in 1982 in Monza Red. 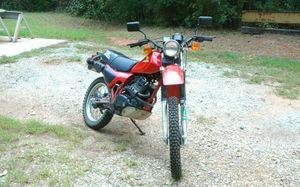 The gas tank, side covers, fenders, and frame were red. The engine was black while the swing arm was silver. The front wheel was 21" while the back was 17". It now had a 12-volt electrical system and Pro-Link suspension. 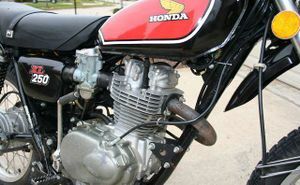 The engine was a 249cc OHC 4-valve single cylinder with 2 exhaust pipes. The transmission was a 6-speed. The serial number began JH2MD030*CM000008. 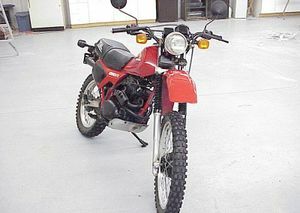 The XL250R'83 was sold in 1983 in Monza Red. 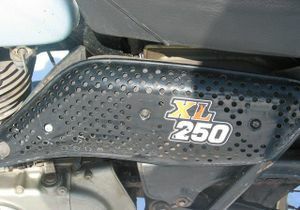 The "XL" logo on the side of the seat was solid white. 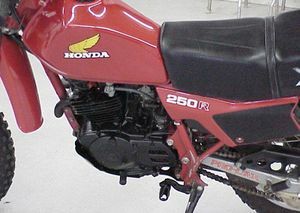 The "250R" side cover had a graphic design. 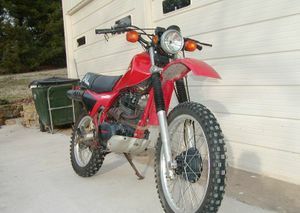 The gas tank, side covers, fenders, and frame were red. The engine was black while the swing arm was silver. The front wheel was 21" while the back was 17". It now had a 12-volt electrical system and Pro-Link suspension. 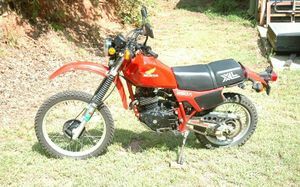 The engine was a 249cc OHC 4-valve single cylinder with 2 exhaust pipes. The transmission was a 6-speed. The serial number began JH2MD030*DM100001. The XL250R'84 was sold in 1984 in Monza Red. 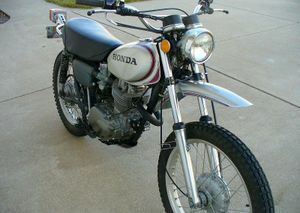 The headlamp was rectangular with a number plate cowling. The seat and fork boots were black. 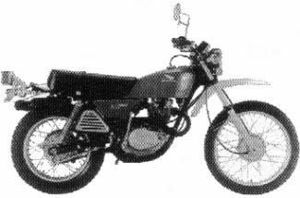 The "250R" side cover decal was white while the number plate panels were black. The front wheel was 21" while the back was 17". It now had a 12-volt electrical system and Pro-Link suspension. 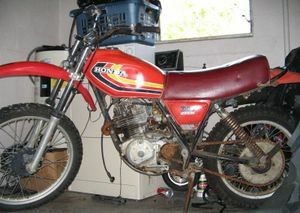 The engine was a 249cc OHC RFVC single cylinder with 2 carburetors and 2 head pipes. It also had a 6-speed transmission. The serial number began JH2MD110*EK000009. 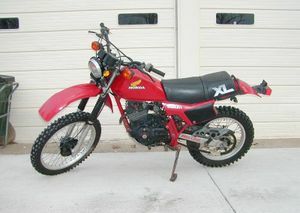 The XL250R'85 was sold in 1985 in Flash Red. 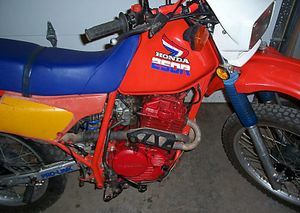 The Honda wing tank decal was red, white, and blue. 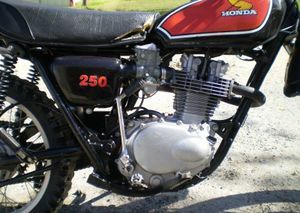 The "250R" tank decal was white and blue. 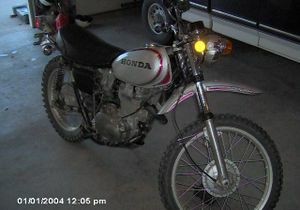 The headlamp was rectangular with a number plate cowling. The seat and fork boots were blue. The number plate panels were yellow. The front wheel was 21" while the back was 17". It now had a 12-volt electrical system and Pro-Link suspension. 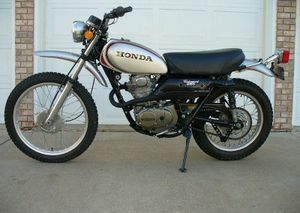 The engine was a 249cc OHC RFVC single cylinder with 2 carburetors and 2 head pipes. It also had a 6-speed transmission. The serial number began JH2MD110*FK100007. 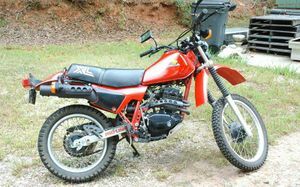 The XL250R'86 was sold in 1986 in Shasta White. 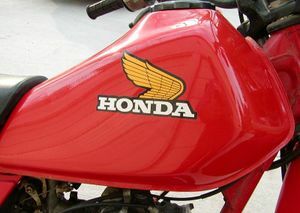 The Honda wing tank decal was red, orange, and yellow. 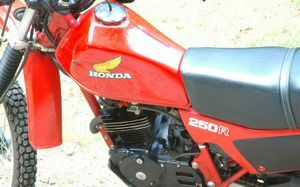 The "250R" tank decal was red and blue. The engine color was red. The number plate panels were black. 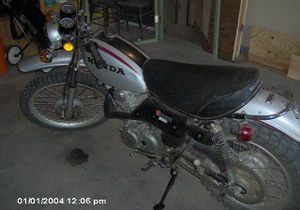 The headlamp was rectangular with a number plate cowling. The front wheel was 21" while the back was 17". It now had a 12-volt electrical system and Pro-Link suspension. 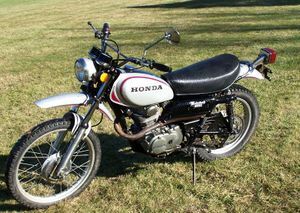 The engine was a 249cc OHC RFVC single cylinder with 2 carburetors and 2 head pipes. It also had a 6-speed transmission. The serial number began JH2MD110*GK200001. 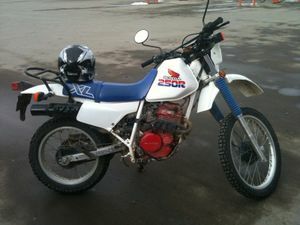 The XL250R'87 was sold in 1987 in Shasta White. 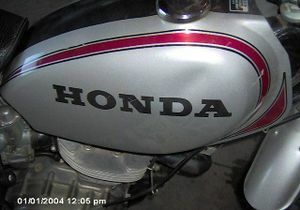 The Honda wing tank decal was red, white, and blue. 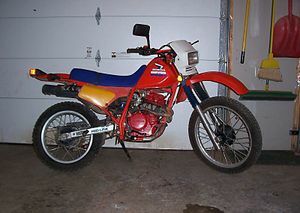 The "250R" tank decal was blue and red. 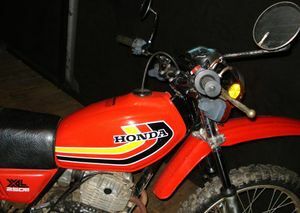 The headlamp was rectangular with a number plate cowling. The front wheel was 21" while the back was 17". The engine color was red. The number plate panels were black. It now had a 12-volt electrical system and Pro-Link suspension. 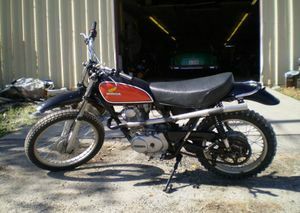 The engine was a 249cc OHC RFVC single cylinder with 2 carburetors and 2 head pipes. It also had a 6-speed transmission. The serial number began JH2MD110*HK300001. This page was last edited on 28 November 2010, at 21:25.